For Halloween outfits, go to the Sesame Street Costumes Page. Sesame Street Elmo Jumper Set (12 months, 18 months, 24 months) If she and Elmo had a laughing contest, it'll be tough to judge. Denim jumper has red stitching and heart shaped pocket on front with fuzzy Elmo appliqué. Onsie underneath has buttons on back and snaps at bottom. Cotton/Polyester Blend. Sesame Street Elmo Overalls (12 months, 18 months, 24 months) Elmo is a sure hit with the babies! 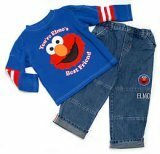 Elmo overall set has fuzzy elmo appliqué on front, cargo pockets, and comes with undershirt. Cotton. Sesame Street 2-pc. Elmo Pant Set (12 months, 18 months, 24 months) Pull over shirt with striped sleeves and embellished front with appliqué and embroidery. Pants are denim pull-on with faux zipper. Two front, two back pockets, patch , and sewn cuffs. Cotton/Polyester Blend. Denim. Embellished. Sesame Street 2-pc. Cookie Monster Pant Set (12 months, 18 months, 24 months) Pull over shirt with striped sleeves and embellished front with appliqué and embroidery. Pants are denim pull-on with faux zipper. Two front, two back pockets, patch , and sewn cuffs. Cotton/Polyester Blend. Denim. Embellished. 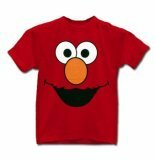 Elmo T-Shirt (12 months, 18 months, 2T, 3T, 4T) PLEASE NOTE: This T-shirt runs small. You may want to order one size up. 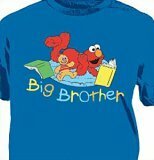 Elmo Big Brother Toddler T-shirt (2T, 3T) A fun shirt for casual living. A childhood favorite Sesame Street has been on PBS entertaining and teaching children for decades. Now available in this fun and adorable t-shirt. Your children will love this fun new shirt style ready for everyday wear. 100% cotton. Zoe Big Sister T-shirt (2T, 4T) A fun shirt for casual living. A childhood favorite Sesame Street has been on PBS entertaining and teaching children for decades. Now available in this fun and adorable t-shirt. Your children will love this fun new shirt style ready for everyday wear. 100% cotton. Sesame Street Elmo and Zoe Lavender Night Gown (2T, 3T, 4T) These flame resistant long sleeve night gowns for girls feature Elmo and Zoe from Sesame Street on the front with Zoe putting toothpaste on Elmo's toothbrush on a lavender background with lace mesh overlay on the front body. Sesame Street Elmo taking a bath L/S Pajamas for girls (2T, 3T, 4T) These flame retardant long sleeve pajamas for girls feature Sesame Street's Elmo and Dorothy taking a bath. Sesame Street Elmo's Skateboard 1 Piece Fleece Footsie Pajamas (2T, 3T, 4T) These flame resistant long sleeve fleece footsie pajamas feature Sesame Street's Elmo on his skateboard with Bert and Ernie wearing roller skates in the background on the front on a blue background. The feet have rubberized grippers on the bottom. Sesame Street Elmo Hide-n-Seek : 4 piece Mix & Match L/S Pajamas (2T, 3T, 4T) These long sleeve pajamas for children feature sesame Street's Elmo in a hide-n-seek print and include 2 tops and 2 bottoms that can be worn interchangeably. These garments are not flame resistant. Manufacturer recommends that this garment should fit snugly to reduce the risk of fire. 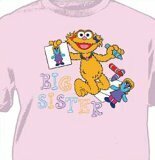 Elmo Big Brother T-shirt A fun shirt for casual living. A childhood favorite Sesame Street has been on PBS entertaining and teaching children for decades. Now available in this fun and adorable t-shirt. Your children will love this fun new shirt style ready for everyday wear. 100% cotton. Zoe Big Sister T-shirt A fun shirt for casual living. A childhood favorite Sesame Street has been on PBS entertaining and teaching children for decades. Now available in this fun and adorable t-shirt. Your children will love this fun new shirt style ready for everyday wear. 100% cotton. 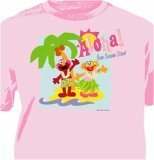 Aloha Girl with Elmo & Zoe T-shirt A fun shirt for casual living. A childhood favorite Sesame Street has been on PBS entertaining and teaching children for decades. Now available in this fun and adorable t-shirt. Your children will love this fun new shirt style ready for everyday wear. 100% cotton. Aloha Boy with Elmo & Zoe T-shirt A fun shirt for casual living. A childhood favorite Sesame Street has been on PBS entertaining and teaching children for decades. Now available in this fun and adorable t-shirt. Your children will love this fun new shirt style ready for everyday wear. 100% cotton. 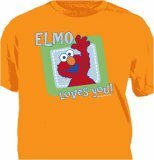 Elmo Loves You T-shirt A fun shirt for casual living. A childhood favorite Sesame Street has been on PBS entertaining and teaching children for decades. Now available in this fun and adorable t-shirt. Your children will love this fun new shirt style ready for everyday wear. 100% cotton. 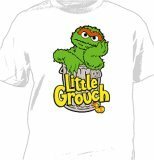 Little Grouch T-shirt A fun shirt for casual living. A childhood favorite Sesame Street has been on PBS entertaining and teaching children for decades. Now available in this fun and adorable t-shirt. Your children will love this fun new shirt style ready for everyday wear. 100% cotton. 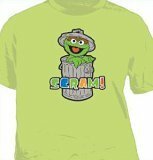 Oscar the Grouch "Scram" T-shirt A fun shirt for casual living. A childhood favorite Sesame Street has been on PBS entertaining and teaching children for decades. Now available in this fun and adorable t-shirt. Your children will love this fun new shirt style ready for everyday wear. 100% cotton. 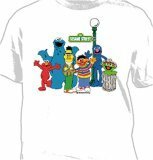 Sesame Waving Group T-shirt (With Elmo, Cookie, Bert, Ernie, Grover, and Oscar the Grouch) A fun shirt for casual living. A childhood favorite Sesame Street has been on PBS entertaining and teaching children for decades. Now available in this fun and adorable t-shirt. Your children will love this fun new shirt style ready for everyday wear. 100% cotton. 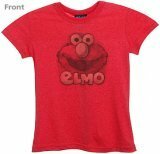 Elmo T-Shirt A fun shirt for casual living. A childhood favorite Sesame Street has been on PBS entertaining and teaching children for decades. Now available in this fun and adorable t-shirt. Your children will love this fun new shirt style ready for everyday wear. PLEASE NOTE: This T-shirt runs small. 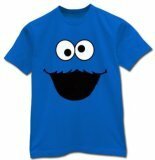 Cookie Monster T-Shirt A fun shirt for casual living. A childhood favorite Sesame Street has been on PBS entertaining and teaching children for decades. Now available in this fun and adorable t-shirt. Your children will love this fun new shirt style ready for everyday wear. 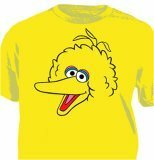 Big Bird T-Shirt A fun shirt for casual living. A childhood favorite Sesame Street has been on PBS entertaining and teaching children for decades. Now available in this fun and adorable t-shirt. Your children will love this fun new shirt style ready for everyday wear. Oscar the Grouch T-Shirt Oscar the Grouch doesn't look very "grouchy" on the front of a brilliant green, cotton tee. 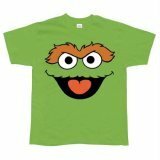 Shirt with everyone's favorite cranky muppet will delight Oscars fans! 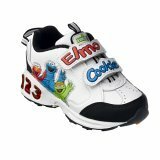 By Target Images of Oscar, Elmo and The Cookie Monster dress up these sneakers with tons of character. LED-powered "123" on the heel flickers when the shoe hits the ground. 2 straps feature easy-close fasteners. 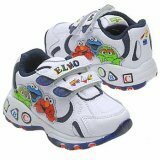 By Target Appeal to your little one’s favorite character, Elmo, with sturdy sneakers that help keep him comfy and on his feet. Navy with white trim, these suede sneakers are lightweight, durable and have a mesh tongue for ventilation. 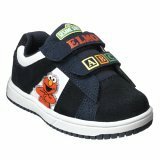 Design features Elmo on the sides and decorated straps with Elmo’s name, "ABC" and a Sesame Street logo. Uppers have easy-close fasteners for quick on-and-off; padded ankles prevent chafing. Rubber soles are treaded for great traction. Elmo Slippers for Toddlers These adorable sock top slippers feature Elmo. The sizes are toddler shoe sizes. 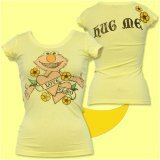 Sesame Street's Elmo Loves You Rib Tank These rib tank tops for women feature Sesame Street's Elmo and read 'Elmo Loves You' on the front on a pink background. Sesame Street's Cookie Monster "Me Love Cookies" Rib Tank These rib tank tops for women feature Sesame Street's Cookie Monster eating cookies on the front and read 'me Love Cookie' on a light blue background. 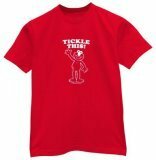 Elmo Sketch T-Shirt 100% preshrunk cotton with design printed on the front, 5.6 oz with shoulder-to-shoulder tape with a seamless collar, and double needle construction throughout. 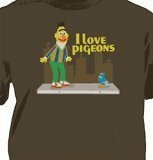 "I Love Pigeons" Bert T-Shirt A fun shirt for casual living. A childhood favorite Sesame Street has been on PBS entertaining and teaching children for decades. Now available in this fun and adorable t-shirt. Just like the ones the kids get to wear, now for adults. Sesame Street's Cookie Monster Faces Blue Lounge Pants These Lounge Pants for women feature an all-over print of Sesame Street's Cookie Monsters Face on a blue and white checkered background. Elmo Fleece Pajama Pants for Women These cozy, fleece pajama pants for women feature a Elmo print. They have both elastic and a drawstring in the waistband. The legs flare slightly near the bottoms. These pajama pants are in junior's sizes. We recommend buying one size up from your normal size. Ernie and Rubber Ducky: Reversible Tie If you grew up with Sesame Street, you will love this reversible silk tie from Sesame Workshop. Yes the tie is reversible, a completely different design on each side. Made of 100% silk. Bert and Ernie: Reversible Tie If you grew up with Sesame Street, you will love this reversible silk tie from Sesame Workshop. Yes the tie is reversible, a completely different design on each side. Made of 100% silk. Big Bird Big Necktie If you grew up with Sesame Street, you will love this Big Bird silk tie from Sesame Workshop. Elmo Fleece Cap This hat will tickle Elmo fans! 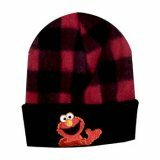 Features Elmo embroidered on the front fold which is knit and the rest of the hat is black and red plaid fleece. One Size Fits All.